The Marijuana business is now legal in Massachusetts. What does that mean? How does it work? We advise prospective license applicants, public officials and others taking a stake in the success of legalization in Massachusetts. Richard M. Evans has practiced law in western Massachusetts for over 35 years, representing business owners, parties to residential and commercial real estate transactions, nonprofit land trusts protecting agriculture and natural resources, parties having interests before municipal bodies. For nearly his entire professional career, he has participated prominently in the marijuana legalization effort. In 1981, he authored the first comprehensive regulation/taxation plan to be introduced as legislation in any state, upon which bills were modeled and introduced in other states. As a member of NORML’s board of directors in the 90s, he was the moving force behind NORML’s Principles of Responsible Cannabis Use, and was awarded its Lifetime Achievement Award in 2011. His numerous op-eds and other writings have helped shape and propel the counter-prohibitionist narrative. He chaired the Yes on 4 Campaign in 2016. Michael D. Cutler has practiced law in Massachusetts for more than 35 years, focusing in criminal defense, civil litigation, and state and municipal administrative proceedings. He has served as a town planning board member, evaluating applications for real estate development permits; he has represented applicants seeking such permits and others, including liquor licenses. As a 20-year member of the National Legal Committee of the National Organization for the Rerform of Marijuana Laws (NORML), Attorney Cutler is well connected with colleagues in other marijuana reform states. He has represented applicants for medical marijuana licenses in Massachusetts, and consulted to a cannabis dispensary licensee in a neighboring state successfully resisting the threat of federal interference. He has spoken on cannabis law and related issues at national conferences, and presented law school lectures and continuing education programs to lawyers and students. After practicing in Boston for more than thirty years, in 2011 he relocated his law office to Northampton, maintaining a Boston presence for clients in Eastern Massachusetts. This book was published before the CCC regulations were released. Please call (413) 584-5111 to schedule a one hour conference, in the office or by telephone, to consider your needs, wishes and circumstances, and to answer your specific questions. Our fee is $420 for the conference. Follow-up legal services will be charged as agreed upon engagement. 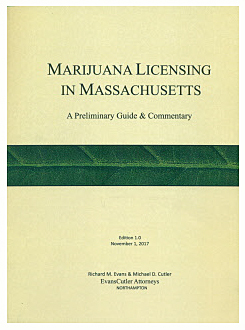 Marijuana Licensing in Massachusetts: A Preliminary Guide and Commentary, by Richard M. Evans and Michael D. Cutler, Edition 1.0 (November 2017). Citizen’s Guide 2.0 to Marijuana Legalization in Massachusetts, by Richard M. Evans, originally issued March 15, 2017, revised October 22, 2017. Steps to Obtaining a Marijuana Establishment License in Massachusetts (a one-page summary). Acceptance of Revenue by municipalities.